Amazon has launched the Kindle e-reader as well as the Kindle e-book store in India. The device - earlier generation non-touch e-reader - will be available at the Chroma retail outlets across the country at a price of Rs 6,999. 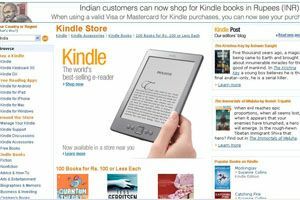 Kindle Store for India will have over a million books and accept payment in Indian Rupee. The Kindle e-reader is a Wi-Fi enabled digital reader with a 6-inch E Ink Pearl display. It has 2GB internal memory and can store up to 1,400 books and supports USB 2.0. The device can be purchased from the Chroma website as well, which claims a shipping time of two days. Strangely, Amazon has not said when will it launch the newer versions of the e-reader, namely Kindle Fire and Kindle Touch, in the country. Kindle Store for India has books from a host of Indian authors as well as some exclusive titles. Russ Grandinetti, vice-president of Kindle Content, Amazon, said, "We are proud to launch this new Kindle store for Indian customers - offering Kindle book purchases in rupees and the ability to buy and read the work of many great Indian authors." Alongside these, the company has also launched Kindle Direct Publishing (KDP), which allows independent authors to publish their books on Kindle Store for Kindle e-readers and apps. This platform will allow them to make their works available for the Indian as well as global audience.